America religious buildings.Do you stop to admire the high altar designed by the great sculptor Manuel Tolsá! 2. Inside the House of Culture, poblano find a fantastic corner: the Palafox Library which houses over 43,000 works, including 6,000 volumes making up the private collection of Bishop Juan de Palafox y Mendoza, whom the space is named . 3. Walk the Alley of the Frogs. There you will find all kinds of furniture and antiques ideal to decorate your home or anywhere in your office. Take a look at the original boutique hotels which, incredibly, offered for sale almost all its furniture! 4. Visit the Temple of San Francisco. Admire its beautiful Baroque façade of the eighteenth and knows the history of San Sebastian de Aparicio, patron of carriers, whose mummified body can be seen inside a beautiful silver urn highly revered by hundreds of faithful. 5. Visit the forts of Loreto and Guadalupe. In them the famous Battle of May 5, where General Ignacio Zaragoza, supported by a brave group of Zacapoaxtlas Indians defeated the powerful French army the spring of 1862. The developed view of the city will surprise you! 6. Taste some delicious chilaquiles with mole in the Royalty Hotel, located in the heart of the state's capital, next to the Plaza de Armas and against the backdrop of stunning image of the cathedral city.We assure you that are the richest of "cool Puebla"! 7. Visit the Museo Amparo. Opened in 1991, this magnificent space houses a wonderful collection of pre-Hispanic pieces of art to the newest of Puebla's art schools and the country. Admire the magnificent museology, accompanied by modern interactive systems. 8. Meet the newly renovated Museum House of the Serdan, housed in a stately home. In this scenario the first shooting of the Mexican Revolution in November 1910. In the facade took place can observe the marks of bullets and one of their rooms during this confrontation a broken mirror. 9. Visit the craft market known as the Parian and takes the best of the poblano popular and Mexico at very good prices. Typical sweets, wooden toys and all kinds of textiles from different populations surrounding the city of Puebla, will conquer you! 10. Know the Municipal Palace, located opposite the Plaza de Armas. 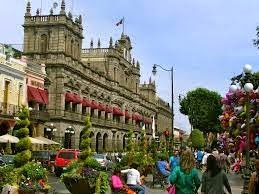 There you can find the offices which released most of the public administration of the city of Puebla and its wonderful balcony where the state governor gives "Cry" on the night of September 15 each. 11. Meet the Capilla del Rosario, called "the shrine of America" by SS Juan Pablo II. This great poblano sanctuary is one of the finest examples of Baroque New Spain. During your visit you will not fail to surprise you with its beautiful corners and covered in gold altars. 12. Admire the curious facade of Regional Museum and House Alfeñique. Its architectural shots seem to be coated with sugar, from which derives its popular nickname. Inside "the Weed" staying photos and documents that tell the history of the city and its surroundings. 13. A few miles south of Puebla, towards Valsequillo, you know one of the most popular zoos in Mexico: African Safari, whose fame is that many of their animals roam freely around the park facilities.An experience for the whole family that can not fail to witness! 14. Housed in a beautiful building from 1580, designed by architect Francisco de Becerra as the residence of the Dean of the Cathedral, the Museum "Casa del Dean" protects an incredible collection of paintings discovered by chance in 1953, under an ancient tapestry .You have to see them! 15. One of the most valuable treasures of the capital of Puebla is certainly rich traditions, which originated in the kitchens of the Colony to mix with native ingredients brought from Europe. One of the finest examples of these colonial kitchens is located in the former Convent of Santa Rosa.Know! 16. Located next to the Temple of San Francisco, the Convention Center is a modern resort where you can find the same-brand boutiques, restaurants and cafes that and green gardens ideal for travel in the company of friends or family.Check it! 17. 3rd Street South East corner with 2 knows the house that killed the animal, decorated with two reliefs which can be seen hunting scenes. According to the legend, Don Pedro Carvajal gave this property to commoner boyfriend of her daughter, who saved him from the attack of a wolf. 18. The Church of the Jesuits is another great building that can not miss during your visit to the capital of Puebla. Up to the last third of the sixteenth century, the Company has a curious "bicolor" facade that alternates the gray stone with a beautiful decorative composition seems recreate a white lace on top.You'll love! 19. Walking down the street 6 Oriente find numerous stores in which the best pastries and sweets poblanas offered. They'll find sweet potatoes, drunks, biscuits, milk sweets, garapiñados and eggnog, among other delights, at great prices! 20. Admire the facade of the House of Dolls. Decorated with a curious group of 16 figures, made in talavera tile is said that this set was a kind of mockery for officials who, in 1792, did not allow the owner to have a taller building than those for public order city.